A professor successfully launches her university’s first online biology course with straightforward, effective labs from Carolina Distance Learning®. In 2015, Alderson Broaddus University (ABU) first offered its General Biology I course as a distance learning class. Dr. Kelley Flaherty was tasked with teaching the course, including identifying labs that fit the course curriculum and that students could easily do at home. It didn’t take long to realize the difficulty involved in putting together a set of labs that fit those criteria. “I spent a lot of time piecing together labs,” she explains. Then Carolina Distance Learning® reached out to Dr. Flaherty. Carolina’s distance learning specialist listened as Flaherty described the course curriculum and requirements. “I needed a customized lab kit that would flow seamlessly with the course content,” says Flaherty, “and the investigations needed to be easy for students to follow and complete.” The distance learning specialist led her to Carolina Distance Learning’s Build Your Own Biology Kit. With more than 40 biology investigations to choose from, Flaherty found it easy to design a kit that paralleled her course curriculum. She also was pleased to find investigations that provided the depth of content needed for the General Biology I course, a curriculum ABU designed for students pursuing science-based majors such as pre-medicine, exercise science, and others. Moving from design to implementation, Flaherty again was pleased with her custom Carolina Distance Learning® kit. “It is very easy to integrate the kit into the course. I experienced no problems at all,” she reports. The clear, step-by-step instructions and comprehensive materials provided for each investigation meant she didn’t have to spend precious time troubleshooting problems. As the course progressed, Flaherty was able to interweave the lab learning with her lectures, making the kit a valuable teaching tool. On the learning side, Flaherty’s students were very successful in completing the investigations in their lab kits. “The kit’s lab manual was well received by students, and they were able to follow the instructions on their own with no problems.” In addition, students benefited from the complementarity of the labs and lectures. 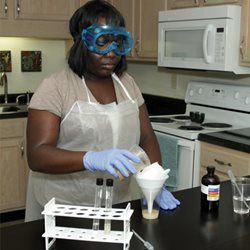 The background content at the beginning of each lab activity reinforces the lecture material, providing students with yet another opportunity to learn and review the information. Building on the success of their first online biology class, ABU expanded their online science course offerings the following year to include Introductory Biology. “Introductory Biology is a general education course for non-science majors,” explains Flaherty, “so a different makeup of investigations was needed.” Flaherty again turned to Carolina Distance Learning® for a user-friendly, customized lab kit. The breadth of investigation topics available enabled her to design a kit that covers the wider curriculum studied in Introductory Biology—everything from atoms to ecosystems! Dr. Flaherty is very happy with the Carolina Distance Learning® kits and the success they are helping her students and the university achieve.